"Equivolume Charts" of each index showing gain/loss, volume, % of daily volume, accumulation and distribution. 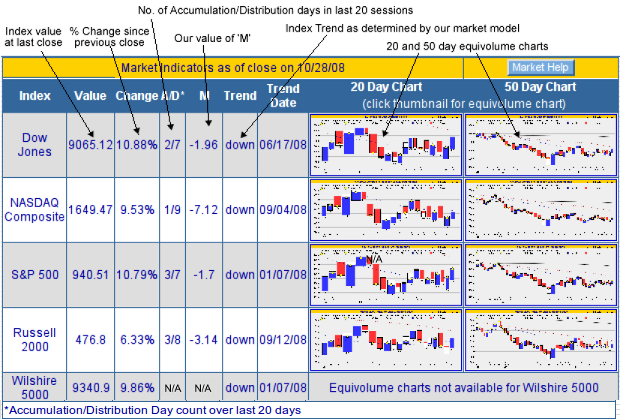 Equivolume charts are explained here. Index trend signals and the date the signal was issued. Our index trend model is explained here. Best perfroming index for the week, 3 months, 6 months and year to date. Our proprietary 'M' indicator of market strength. Positive values of M indicate the market is under accumulation, while negative values indicate the market is under distribution. M is calculated using a weighted sum of Accumulation Days minus a weighted sum of Distribution Days. More recent days are given a higher weight. As part of the Market Analysis display, we also include a summary of the best performing industries and the industries that are moving to prominence. The industries that are moving up the rankings may be where the biggest price gains are to found.